Early Pithouse period villagers played a generative role in the cultural and historical sequence of the Mogollon region, which is best known for the stunning black-on-white pottery of the Classic Mimbres culture. This volume presents a complete report on the archaeology of two important Early Pithouse settlements located along the Rio Mimbres, including detailed accounts of the excavation units, depositional contexts, architectural details, radiocarbon dates, miscellaneous artifacts, and ceramic frequency distriductures. The Thomson and McAnally sites contain architecture, artifacts, and other remains of the earliest relatively sedentary horticulturalists to occupy this part of the Southwest. The authors synthesize the data about charges over time in the villagers' lifestyle to develop a new chronology for the occupation of the region. Located in the mountains of east-central Arizona, Grasshopper Pueblo is a prehistoric ruin that has been excavated and interpreted more thoroughly than most sites in the Southwest: more than 100 rooms have been unearthed here, and artifacts of remarkable quantity and quality have been discovered. Thanks to these findings, we know more about ancient life at Grasshopper than at most other pueblos. Now two archaeologists who have devoted more than two decades to investigations at Grasshopper reconstruct the life and times of this fourteenth-century Mogollon community. 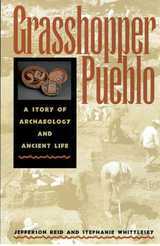 Written for general readers—and for the White Mountain Apache, on whose land Grasshopper Pueblo is located and who have participated in the excavations there—the book conveys the simple joys and typical problems of an ancient way of life as inferred from its material remains. Reid and Whittlesey's account reveals much about the human capacity for living under what must strike modern readers as adverse conditions. They describe the environment with which the people had to cope; hunting, gathering, and farming methods; uses of tools, pottery, baskets, and textiles; types of rooms and households; and the functioning of social groups. They also reconstruct the sacred world of Grasshopper as interpreted through mortuary ritual and sacred objects and discuss the relationship of Grasshopper residents with neighbors and with those who preceded and followed them. 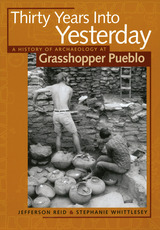 Grasshopper Pueblo not only thoroughly reconstructs this past life at a mountain village, it also offers readers an appreciation of life at the field school and an understanding of how excavations have proceeded there through the years. For anyone enchanted by mysteries of the past, it reveals significant features of human culture and spirit and the ultimate value of archaeology to contemporary society. Often seen as geographically marginal and of limited research interest to archaeologists, the Jornada Mogollon region of the southwestern United States and northern Mexico deserves broader attention. Late Prehistoric Hunter-Gatherers and Farmers of the Jornada Mogollon presents the major issues being addressed in Jornada research and reveals the complex, dynamic nature of Jornada prehistory. The Jornada branch of the Mogollon culture and its inhabitants played a significant economic, political, and social role at multiple scales. This volume draws together results from recent large-scale CRM work that has amassed among the largest data sets in the Southwest with up-to-date chronological, architectural, faunal, ceramic, obsidian sourcing, and other specialized studies. 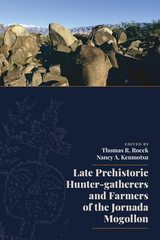 Chapters by some of the most active researchers in the area address topics that reach beyond the American Southwest, such as mobility, forager adaptations, the transition to farming, responses to environmental challenges, and patterns of social interaction. Late Prehistoric Hunter-Gatherers and Farmers of the Jornada Mogollon is an up-to-date summary of the major developments in the region and their implications for Southwest archaeology in particular and anthropological archaeological research more generally. The publication of this book is supported in part by the Arizona Archaeological and Historical Society and the Center for Material Culture Studies at the University of Delaware. 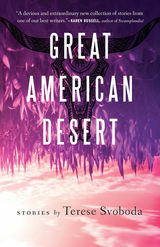 Author Tammy Stone focuses on a number of general deliberations on the archaeology of middle-range society and the prehistory of the American Southwest. This includes the complex dynamics of migration, identity, ethnic interaction, and the ability of archaeologists to identify these patterns in the archaeological record. The integration and ultimate expulsion of a group of Kayenta Anasazi at Point of Pines Pueblo in the Mogollon Highlands of east-central Arizona provides a case study and location where these themes played out. Stone uses a detailed architectural analysis of the pueblo to attain a nuanced and dynamic understanding of migration from the perspective of both the Kayenta migrants and their Mogollon hosts. 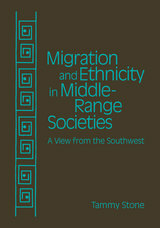 By examining the choices that individuals, families, and small groups made about identity and alliance from the perspective of both the migrants and host community—the latter being an aspect often missing from analyses of migration—this volume provides never-before-published data on Point of Pines Pueblo and contributes considerably to the study of community dynamics at large. Classic site reports establish the Mogollon on their own cultural track distinct from the Anasazi and also document the earliest known association of tree-ring dates with pottery in the Southwest. The excavations of Mogollon sites reported on in this volume were conducted at the early (1939–1941) field schools in Forestdale, Arizona. 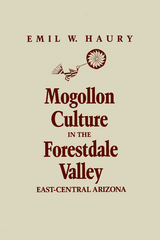 When Emil Haury defined the ancient Mogollon in the 1930s as a culture distinct from their Ancestral Pueblo and Hohokam neighbors, he triggered a major intellectual controversy in the history of southwestern archaeology, centering on whether the Mogollon were truly a different culture or merely a “backwoods variant” of a better-known people. In this book, archaeologists Jefferson Reid and Stephanie Whittlesey tell the story of the remarkable individuals who discovered the Mogollon culture, fought to validate it, and eventually resolved the controversy. Reid and Whittlesey present the arguments and actions surrounding the Mogollon discovery, definition, and debate. Drawing on extensive interviews conducted with Haury before his death in 1992, they explore facets of the debate that scholars pursued at various times and places and how ultimately the New Archaeology shifted attention from the research questions of cultural affiliation and antiquity that had been at the heart of the controversy. In gathering the facts and anecdotes surrounding the debate, Reid and Whittlesey offer a compelling picture of an academician who was committed to understanding the unwritten past, who believed wholeheartedly in the techniques of scientific archaeology, and who used his influence to assist scholarship rather than to advance his own career. Prehistory, Personality, and Place depicts a real archaeologist practicing real archaeology, one that fashioned from potsherds and pit houses a true understanding of prehistoric peoples. 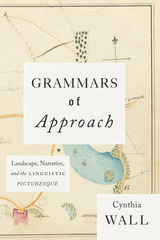 But more than the chronicle of a controversy, it is a book about places and personalities: the role of place in shaping archaeologists’ intellect and personalities, as well as the unusual intersections of people and places that produced resolutions of some intractable problems in Southwest history. Combining anthropology, archeology, and evolutionary theory, Paul E. Minnis develops a model of how tribal societies deal with severe food shortages. While focusing on the prehistory of the Rio Mimbres region of New Mexico, he provides comparative data from the Fringe Enga of New Guinea, the Tikopia of Tikopia Island, and the Gwembe Tonga of South Africa. 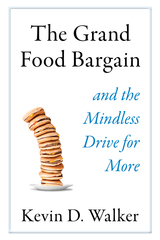 Minnis proposes that, faced with the threat of food shortages, nonstratified societies survive by employing a series of responses that are increasingly effective but also are increasingly costly and demand increasingly larger cooperative efforts. The model Minnis develops allows him to infer, from evidence of such factors as population size, resource productivity, and climate change, the occurrence of food crises in the past. Using the Classic Mimbres society as a test case, he summarizes the regional archeological sequence and analyzes the effects of environmental fluctuations on economic and social organization. He concludes that the responses of the Mimbres people to their burgeoning population were inadequate to prevent the collapse of the society in the late twelfth century. In its illumination of the general issue of responses to food shortages, Social Adaptation to Food Stress will interest not only archeologists but also those concerned with current food shortages in the Third World. Cultural ecologists and human geographers will be able to derive a wealth of ideas, methods, and data from Minnis's work. For decades archaeologists have used pottery to reconstruct the lifeways of ancient populations. It has become increasingly evident, however, that to make inferences about prehistoric economic, social, and political activities through the patterning of ceramic variation, it is necessary to determine the location where the vessels were made. Through detailed analysis of manufacturing technology and design styles as well as the use of modern analytical techniques such as neutron activation analysis, Zedeño here demonstrates a broadly applicable methodology for identifying local and nonlocal ceramics. Pithouses are the earliest identifiable domestic architecture in many areas of the world, and can provide insights into the origins of communities--a fundamental component of past and present societies. In this book, Lisa Young and Sarah Herr invite archaeologists to explore the development of communities using information from pithouse sites in the American Southwest. Using regional and topical syntheses to investigate the formation of pithouse communities, contributors to this volume examine the complex relationship between the economic transition to agricultural dependence and the social changes associated with sedentism. They discover that during this transformation, peoples' relationship with the landscape changed in ways that affected their use of space, community organization, and cultural identity. Employing various theoretical perspectives, these contributions analyze changes in pithouses, site layout, communal architecture, and settlement patterns to investigate the development of place-based communities. 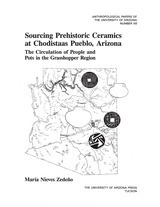 Chapters look at community formation strategies in populous regions like the northern San Juan Basin, the southern Colorado Plateau, Mimbres/southern Mogollon, and Hohokam Basin and Range and compare them with social structures in more sparsely populated regions like the northeast Hohokam peripheries, the Arizona Transition Zone, the Cibola region, southeast New Mexico, and the northern Rio Grande. The book also includes thematic discussions of panregional economic change, the complex relationship between house and household, and the demographic shifts accompanying the Neolithic Demographic Transition. 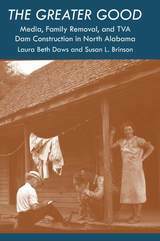 An essential book for students and archaeologists interested in the origins of communities, Southwestern Pithouse Communities is also an important comparative resource for scholars interested in social change during the transition to settled village life. For thirty years, the University of Arizona Archaeological Field School at Grasshopper—a 500-room Mogollon pueblo located on what is today the Fort Apache Indian Reservation in Arizona—probed the past, taught scholars of international repute, and generated controversy. This book offers an extraordinary window into a changing American archaeology and three different research programs as they confronted the same pueblo ruin. 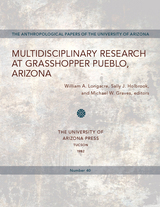 Like the enigmatic Mogollon culture it sought to explore and earlier University of Arizona field schools in the Forestdale Valley and at Point of Pines, Grasshopper research engendered decades of controversy that still lingers in the pages of professional journals. Jefferson Reid and Stephanie Whittlesey, players in the controversy who are intimately familiar with the field school that ended in 1992, offer a historical account of this major archaeological project and the intellectual debates it fostered. Thirty Years Into Yesterday charts the development of the Grasshopper program under three directors and through three periods dominated by distinct archaeological paradigms: culture history, processual archaeology, and behavioral archaeology. It examines the contributions made each season, the concepts and methods each paradigm used, and the successes and failures of each. The book transcends interests of southwestern archaeologists in demonstrating how the three archaeological paradigms reinterpreted Grasshopper, illustrating larger shifts in American archaeology as a whole. Such an opportunity will not come again, as funding constraints, ethical concerns, and other issues no doubt will preclude repeating the Grasshopper experience in our lifetimes. Ultimately, Thirty Years Into Yesterday continues the telling of the Grasshopper story that was begun in the authors’ previous books. In telling the story of the archaeologists who recovered the material residue of past Mogollon lives and the place of the Western Apache people in their interpretations, Thirty Years Into Yesterday brings the story full circle to a stunning conclusion.